Our representative will meet you upon arrival at Amman Airport and assist with your visa to Jordan. After, meet our driver and continue to Madaba for dinner and overnight at 3* hotel. Breakfast at the hotel, then our driver will meet you to continue to the Church of St. George to view the oldest preserved ancient mosaic map of the Holy Land dating back to the 6th century BC. Continue to Mt. Nebo and retrace the steps of Moses and admire the spectacular view of the Promised Land just as he did over 2,000 year before. It is very easy to feel that you have arrived some place special. On a clear day Jerusalem, Jericho and the Dead Sea can be seen. A memorial in Moses’ honor can be found at the entrance to the early Byzantine Christian church where Moses is believed to have died. Continue to one of Jordan’s loveliest hideaways and its most impressive ecotourism project - the 15th century stone village of Dana. Perched high on a cliff, this charming community offers spectacular views of Wadi Araba. Stroll through the terraced gardens and after admire the fine craftsmanship of the local art scene. Dana is known for its handcrafted silver jewellery, dried fruit, olive oil soap, and leather tanning. Dinner and overnight in Dana at 3* hotel. Breakfast at the hotel, then start the day trekking from Dana Nature Reserve, one of Jordan's loveliest conservation and wilderness areas, to Feynan Canyon. 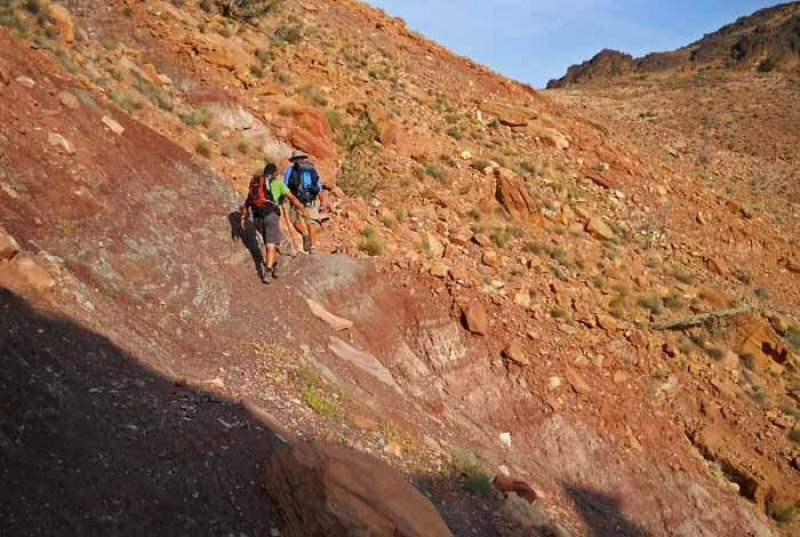 This spectacular downhill trek winds through the sandstone gorge of Wadi Dana. Along the way, you will likely encounter the local Bedouin herding their sheep and goats. During the trek, we will also stop for lunch in a nice shaded area. As you approach Feynan Canyon, you will be met with refreshing Bedouin tea and your campsite already setup for the night. Dinner and overnight at the mobile camp. Breakfast at the camp, then In the morning, start trekking through the stony desert with spectacular views of the high mountain ranges to the east and the vast Wadi Araba desert to the west. Again, we will stop for lunch along the way. In the afternoon, head further towards the foot of the mountains. Dinner and overnight at the mobile camp. After breakfast we set off leaving the stony "Hamada" desert behind us. We continue our trek and walk around the foot of the mountain to reach the trail head of an ancient Bedouin migration path that ascends steeply across rocks and small boulders through a twisty track rising high into the mountain. This section can be challenging and takes around 3 hours. 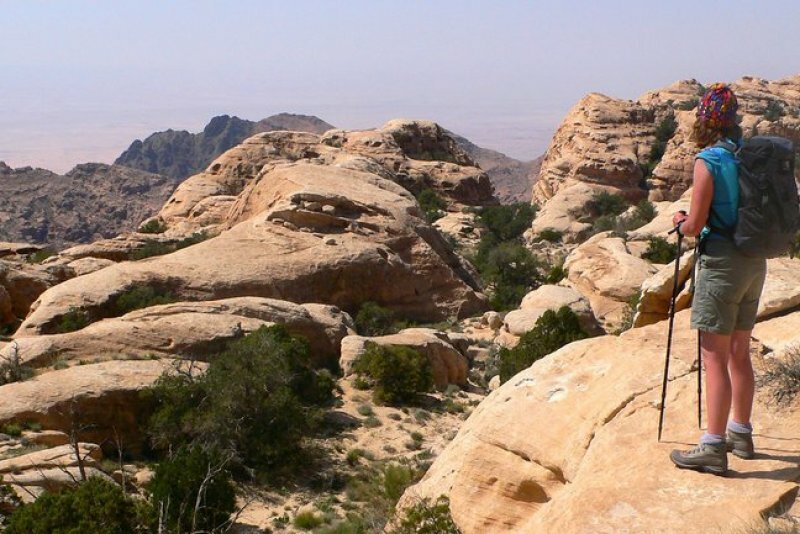 The route offers stunning views westwards towards the fascinating Wadi Araba desert. 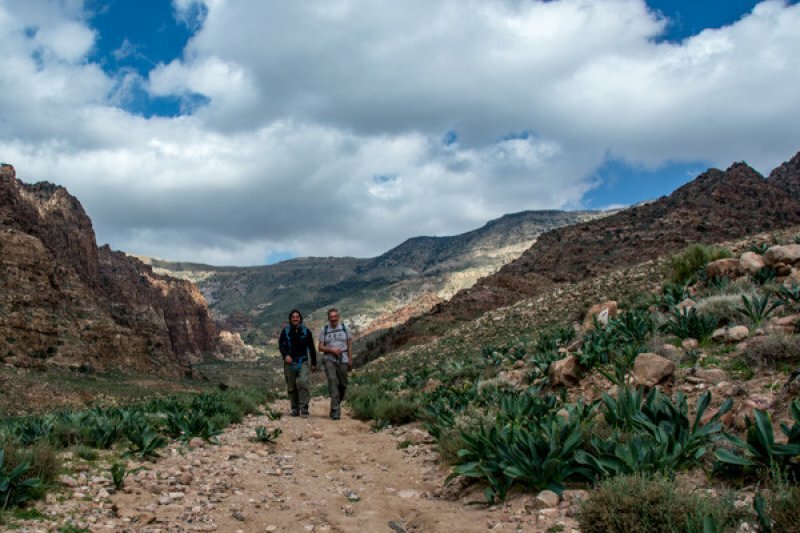 We eventually reach the top of a high saddle which has some of the most beautiful scenery of the trek before descending following a small goat track to the river valley of Wadi Feid. Here we have a well-deserved opportunity to refresh and cool down in its cool water, a perfect place for lunch. We then continue our trek, walking upstream and maneuvering around a beautiful dense garden of oleander, willow, tamarisk and reed. Beyond this we walk along a dry river bed surrounded with colourful sandstone outcrops to reach our camping spot where our crew will be waiting for us with Bedouin tea and after a wash and rest, a Bedouin style evening meal. Dinner and overnight at the mobile camp. With an early rise and breakfast, we continue our trek by retracing our path along the riverbed gradually climbing up the hills following ancient migration paths to uncover some of the most spectacular sceneries in Jordan! This part of the route is quite challenging and includes some scrambling to overcome some of the larger obstacles. 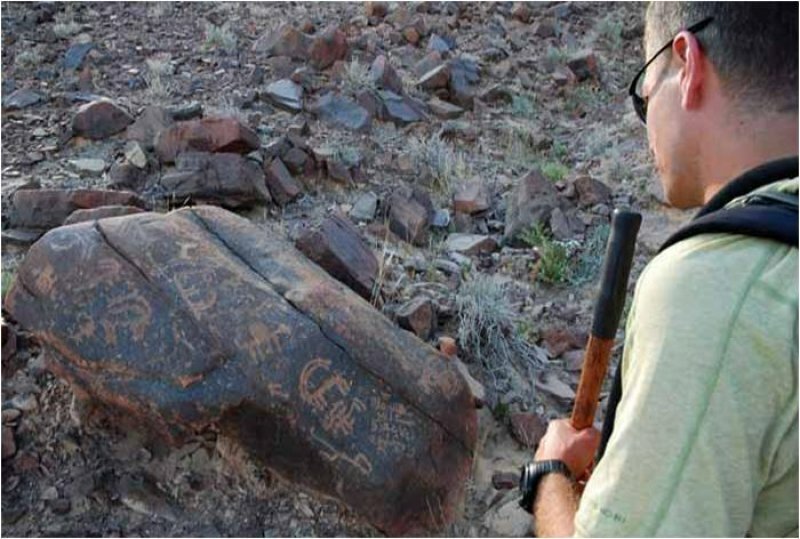 The route becomes less well-defined and we depend on our Bedouin guide for the best route skirting the Sharah Mountains. 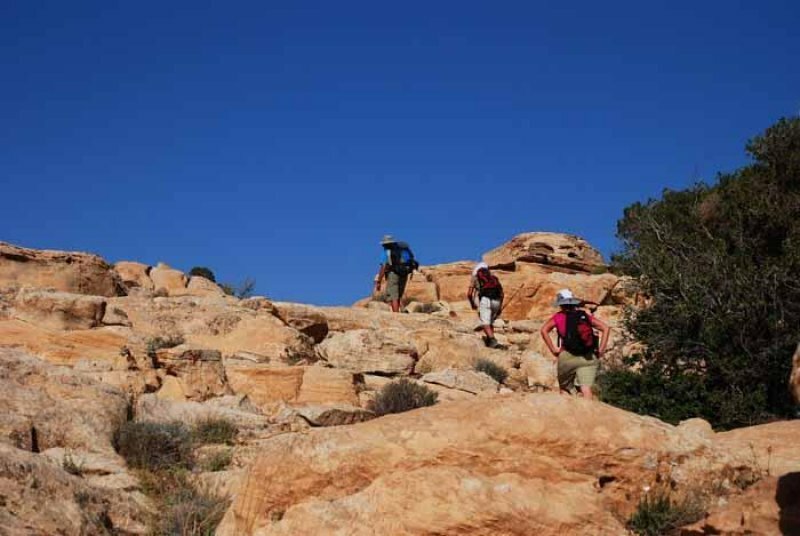 The trail continues along the Wadi floor and gently climbs up into the pale colored sandstone distinctive hill that offers incredible views across the surrounding landscapes of mountains and canyons. We find shade here and rest for lunch before continuing our trek again with a descent, followed by a gentle uphill climb to reach a bare rock slab perfectly located to spend another magical night in the wild where we set up camp and enjoy the peaceful haven of the mountains scenery around us. Dinner and overnight at the mobile camp. With an early rise and breakfast, we continue our trek with some dramatic changes of scenery, from the deep Wadis to the wonderful wide-open sandstone hills. We will stop for lunch then continue to the beautiful nature-crafted white dome of Beida, we descend into Little Petra and visit this fabulous site for a little taste of the magnificence of Petra which we will encounter tomorrow. With just a short walk then our route takes us to our campsite uniquely located and surrounded by amazing sandstone mountains. Dinner and overnight at 7 Wonders Bedouin Camp. Today, after breakfast at the camp, enter Petra in a way in which very few visitors have – through the secret entrance to the Monastery. Start the trek on a trail which initially winds across open farmland. 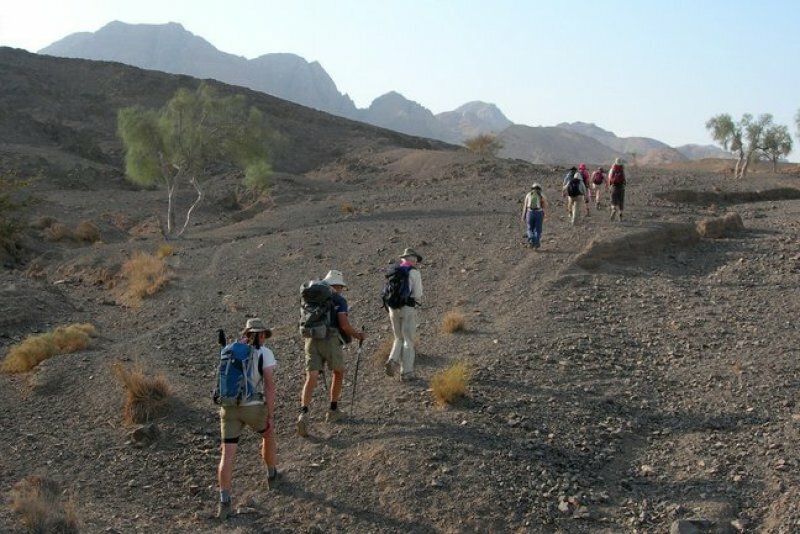 For the first two hours of the trek the path contours around the mountain ridge with fantastic views to Wadi Araba desert. Then the climb starts as the narrow route, open to sheer drop-offs, leads to perhaps Petra's most awe-inspiring monument, the Monastery. We will then walk down the well-worn Nabataean steps into the heart of Petra, where we will visit Facades Street, Urn Tomb, the Theatre, Colonnaded Street, Royal Tombs and Qasr al Bent before having lunch near the amphitheatre. We then exit Petra via the Dark Siq (a secondary Siq) to visit the High Place of Sacrifice before re-entering the site through the main Siq so you get to experience the most famous view of Petra, ‘Al Khaznah’ or ‘The Treasury’ as though you are entering for the first time. After enjoying the unparalleled beauty of Al Khaznah we then exit Petra and head to Seven Wonders campsite in Little Petra for a second night. In the evening, we visit ‘Petra by night’ walking to Al Khaznah by the light of thousands of candles, listening to traditional Bedouin music, singing and stories under the starlit night skies. This truly is a magical end to our trek. Dinner and overnight at 7 Wonders Bedouin Camp. 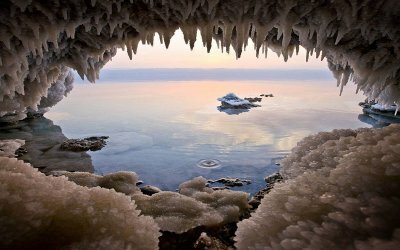 Day 13: Dead Sea - Amman Airport According to your flight schedule, we transfer you to Queen Alia Airport and wish you a safe journey and a speedy return to our beautiful country!